The desert may have a reputation for being a harsh place to grow … well, anything … but the Coachella Valley and surrounding area is home to dozens of local farms – many of which supply Two Bunch Palms restaurant Essense with its organic, seasonal produce. No crop, however, is better known in these parts than the sweet and succulent date, which have been flourishing in the Coachella Valley since offshoots from the Middle East were planted more than a century ago. The region now supplies 95 percent of the country’s date supply, so whether you’re a bona fide date fan or need a little nudge to give ‘em a try, this is the place to be when it comes to date dishes. It’s the kind of dreamy dish that would make any omnivore want to swap bacon and eggs for a vegan breakfast: a luscious coconut milk-based pudding spiked with nutrient-dense chia seeds, toasted almonds, and, yes, dates. Sticking with Essense’s focus on local, seasonal, and sustainable organic produce (some of which it gets right there on the Two Bunch Palms property), Executive Chef Jenna van Loon sources her dates from nearby Golden Girl Date Farm, just 30 miles down the road in Coachella. Before you write this one off for being too weird, think about it: If you like dates and you like sushi, you might as well try both at the same time, right? 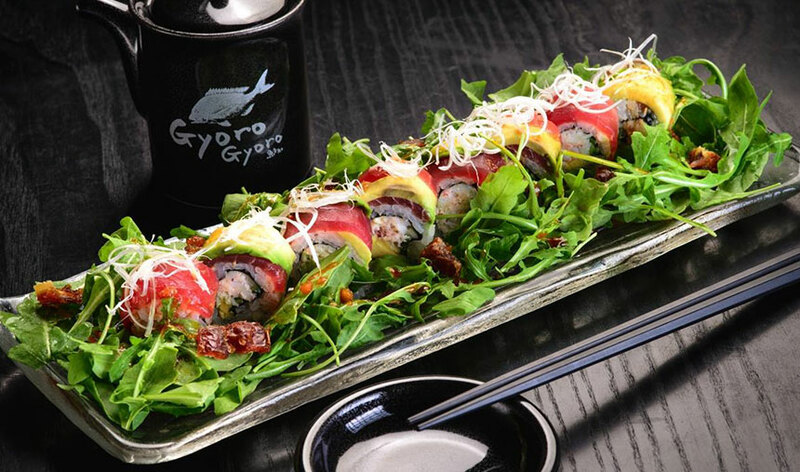 At this popular Japanese restaurant along bustling Palm Canyon Drive, the Palm Springs roll is stuffed with snow crab and avocado, topped with tuna and Tokyo scallions, and then served over a date-dotted arugula salad … giving new meaning to the term sushi date. Andie Hubka, chef and owner of this neighborhood wine bar and small-plates restaurant, uses Medjools for her local date plate, stuffing them with Point Reyes Blue Cheese (creamier than regular old blue.) The dates get hit with a blow torch, which caramelizes the tops, releases some of the natural sugars, and gets the cheese nice and bubbly. The plate is finished with sliced almonds and a drizzle of chive-and-garlic-infused olive oil. Many customers actually order the dish for dessert. Hey, no judgments! 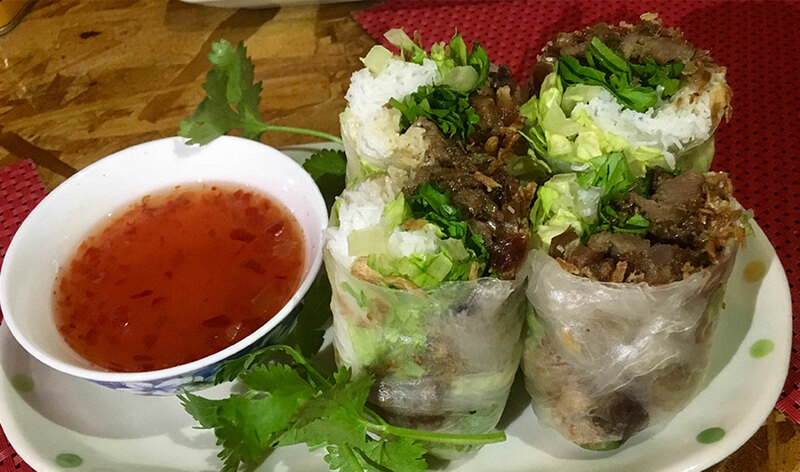 At this Vietnamese-American joint, chef and owner Tai Spendley focuses on taking traditional Vietnamese dishes and giving them an unexpected twist, often with ingredients that aren’t usually found in Vietnamese cooking. Case in point: The chilled spring roll is infused with Asian flavors thanks to lemongrass-marinated pork, cilantro, and Thai basil, but then gets a nod to the Coachella Valley with the addition of diced Medjool dates, too. Many visitors simply can’t bear to pay a visit to the Valley without stopping for a cool and creamy date shake, perhaps the most iconic date item in the desert. While you’re never too far from a date shake around here, you can find a famous favorite at Hadley Fruit Orchards, which has been churning them out for decades. The shop uses Deglet Noor dates blended with vanilla ice cream and milk to create a just-lumpy-enough-to-be-lovely creamy shake. You’ve also got the option to add banana, nutmeg, or cinnamon to the sweet treat … but you can’t go wrong with the original, if you ask us.